AUCTION!! SPECTACULAR WATERFRONT ESTATE HOME IN JUPITER, FL. DEEP BLUE WATERFRONT HOME WITH NO FIXED BRIDGES & INTRACOASTAL VIEWS!!! FISHERMAN’S DREAM HOME WITH 60’ DOCK. RARE WATERFRONT OPPORTUNITY. This sale will be conducted at an open cry public auction on Wednesday February 28th, 2018 at 2:00 PM EST at the property. This corporately owned home will be sold to the highest bidder at or above the published reserve. The reserve price is set at $1,000,000 BELOW fair market value for this home. This sale is absolute at or above the reserve of $2,650,000. 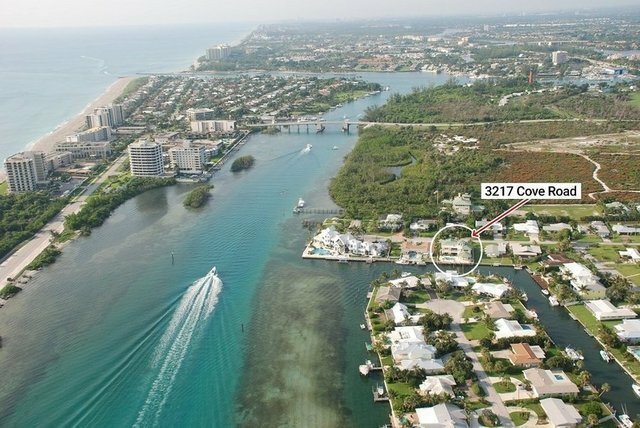 A slice of tropical heaven located in the most magical setting with Intracoastal Waterway views, this one of a kind DEEP BLUE WATERFRONT property is poised prominently on the first canal just .7 miles north of the Jupiter Inlet! You can be out in the ocean with lines in the water in 15 minutes! A true Intracoastal entertainment home, this 6,793 sq ft total and 3,891 sq ft A/C, 4 bedroom, 3 1/2 bathroom residence will offer all the space you need for hosting and incorporates an exhilarating variety of casual and occasion-inspired zones that flow to the outdoors. The ample indoor and 2,902 sq ft of outdoor space and beautiful lanai area highlights this magnificent waterfront home. This masterpiece is a must see! The tropical charm creates a comfortable and casual ambience in the home wide open spaces and banks of windows and huge sliding glass doors for uninterrupted panoramic views of the Intracoastal, Pool and Spa across each of its three dazzling levels. This gem offers a 1st and 2nd floor master suite as well as 2 additional bedrooms located on the 2nd floor perfect for kids or guests. The 2nd floor master suite leaves nothing to be desired with its morning kitchen, luxury bath and incredible walk-in closet. In the signature kitchen, you’ll experience immersive water views alongside details like a marble preparation island, 2 bars with seating for 8, plenty of custom signature bamboo cabinetry, and an easy flow to dramatic waterside dining and living areas. Florida living is all about the outdoors, and here you’ll find a fabulous contemporary pool and spa with twin fire bowls and triple waterfalls, expansive sundeck and an impressive deep-water dock. The 2nd floor Great Room opens onto a terrace where you can enjoy serving cocktails whilst overlooking the open pool and water views. Other features range from custom details throughout, Icynene insulation, hurricane impact windows/doors, Italian travertine marble and bamboo floors, volume ceilings with ornate crown molding. Lower level provides 3 car parking and additional storage, a man cave workshop equipped with cable, air conditioning, urinal and a hurricane shelter. A short stroll to Jupiter Harborside and all the restaurants, grocery, retail and nightlife. You only live once! Directly from the dock, untie the yacht or launch your kayaks and paddle boards and know that you have landed the best spot ever. The perfect setting in the perfect location! Take a stroll from this spectacular location on the .6 mile sandbar where you will find conch shells, starfish, sea urchins, sea cucumbers, and watch the manatee cruise by! Great spot for an early sunrise walk with your cup of coffee or at sunset with a glass of wine! It doesn’t get any better than this…an income producer, you can rent this home till your heart’s content or just live the dream as it is. Settle in for the best sunrises/sunsets and family retreats you can imagine. This is the Florida family home of dreams, located merely minutes from downtown and our local International Airport. This exclusive community is a world away and like no other in Jupiter.